I may carry a pocket knife, but I’m still a lady. 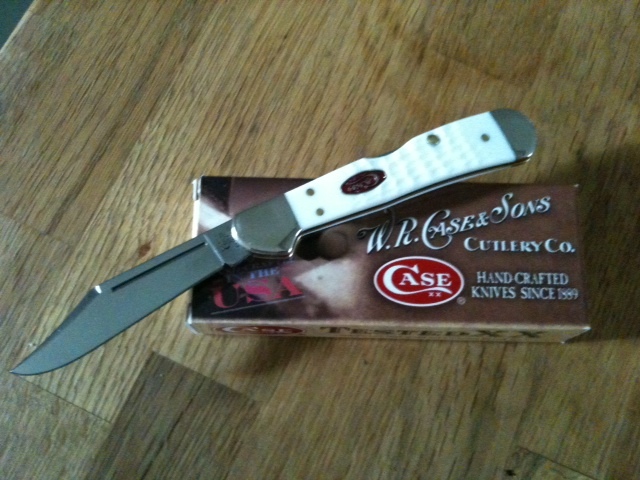 I had told Sonny that I fancied a pocket knife and how handy it would be to have one. Being the good husband that he is, he presented one to me as a Christmas gift. Its just the right size and is made by the Case company. They have been making all types of knives since 1889 and I also like the fact that they are still produced in the good ol’ USA. When you think about what a lady might carry in her pocket you wouldn’t think of a knife as being one of those objects. Chapstick or lipstick maybe but not a knife. Since moving out here I’ve encountered numerous occasions that a pocket knife would’ve come in handy. I don’t how many times I have been working outside and needed to cut the string from a bale of straw, twine to tie up the tomatoes, or cut open a bag of grain. Whatever the job I’m doing I have to stop and run up to the house to retrieve a knife or pair of scissors, because naturally I forgot to grab one before I started. It will also be a convenient tool this spring when I come across a thatch of wildflowers I might want to cut or a vine of briar thorns that grab hold of my shirt. I have already put this pocket knife to use many times and I have come to the conclusion that I would be lost without one now. It has become a down right necessity. Every morning when I get dressed I automatically shove it down into my pocket where it nestles perfectly….right next to a tube of chap stick. As I write this John and Sonny are busy working on the solar hot water heater. They have all the pipes hooked up to the solar panels on the roof and are in the process of connecting them up to the hot water heater. Sonny will give you an update soon. And of course if you have any questions he will be happy to answer them. This entry was posted on Friday, December 30th, 2011 at 2:48 pm and is filed under Farming, Garden, Hay, Solar Hot Water. You can follow any responses to this entry through the RSS 2.0 feed. You can leave a response, or trackback from your own site. I have had to borrow it several times. If I wouldn’t lose mine it would be better off. I think that one was about $50 bucks.